Combining vintage inspired style and luxury design, this stunning vine patterned band from the Neil Lane Designs collection is crafted in shining sterling silver and set with 0.21ct carat of diamonds. Neil Lane Designs are uniquely beautiful. 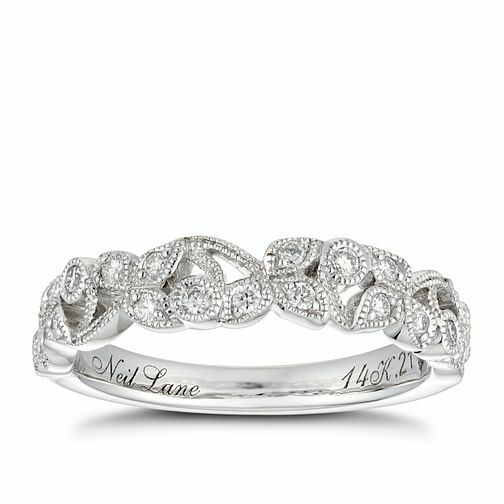 Neil Lane 14ct White Gold 0.21ct Diamond Vine Wedding band is rated 5.0 out of 5 by 2. Rated 5 out of 5 by Anonymous from Unusual design and elegant wedding band I didn't want to go for a plain wedding band. I have a solitaire engagement ring and wanted something different and decorative for my wedding ring to complement it. This ring has a very delicate design and looks absolutely stunning. With diamonds set within the vine design itself, it has its own sparkle so looks great worn on its own too.